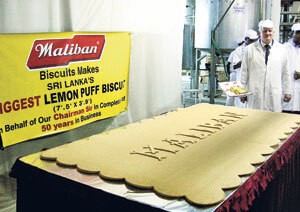 Bakery Industry: Srilankan Maliban Creates " World Largest Lemon Puff Biscuit "
Srilankan Maliban Creates " World Largest Lemon Puff Biscuit "
The House of Maliban created history by setting a new Guinness World Record by creating the world's Biggest Lemon Puff which today is the most popular lemon cream biscuit in the market at present. Maliban is the first biscuit manufacturer to achieve a such a great height from Sri Lanka. The previous Guinness World Record for the largest cream biscuit was held by Executive Chef Paul Thacker and amateur biscuit master Simon Morgan of the United Kingdom for creating the biggest custard cream filled biscuit measuring 59 cm in length, 39 cm in width, 6.5 cm in height. This record which was set on 18th November 2010 and was broken by reputed local biscuit manufacturer House of Maliban of Sri Lanka. The massive Lemon Puff created by the company stands at a final production size in length 7"5" (2260mm), breadth 3"9" (1143mm) and Sq.Metres 2.58 m2. This one of a kind biscuit can be served to 1012 persons.